"This book is two reading treats in one: a thrilling page-turner stocked with uniquely compelling characters…and a sophisticated, thought-provoking look at the conflict in the Middle East, and how it’s covered by the media." 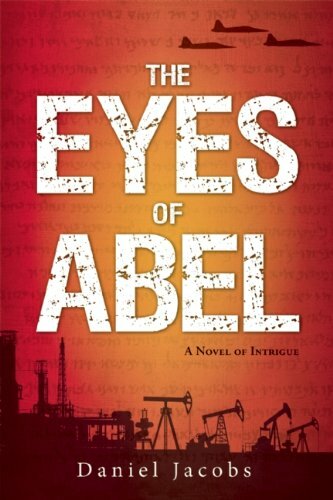 "[T]akes Israel to the brink in a political thriller"
"The Eyes of Abel is a gripping tale of the tension between love and political intrigue. Jacobs' thought-provoking debut novel provides an eye opening prism that shines a new light on the conflict in the Middle East while keeping me turning the pages late at night." "I have made a career analyzing good and bad stories. Jacobs has woven a winner in the gripping tale of The Eyes of Abel. I can't wait for the film!" Roger Charlin, the Pulitzer Prize-winning journalist for America’s paper of record, had enjoyed a meteoric career - until now. It never crossed his mind that his next assignment to research controversial passenger screening protocols at Israel Airlines could alter his life forever. While he prepared for intense worldwide attention following publication of yet another explosive exposé, he was completely unprepared for the seductive Israeli security agent and a disorienting roller-coaster ride that would begin in JFK’s international departure lounge. From a botched undercover sting to ironic infatuation, Charlin’s quest for the truth about the Israeli agent and his own life takes him to Israel, amidst a series of cataclysmic and gut wrenching events in the Middle East. As the region teeters on the verge of all-out war, the world holds its breath, and Charlin becomes an unwitting traveler in the modern day writing of “biblical” history. Daniel Jacobs’ The Eyes of Abel is a factually inspired, powerful, and prophetically captivating thriller about passion, the media, and international intrigue set in Manhattan, Washington DC, Paris, and through to one of the world’s most divisive and fascinating regions, the Middle East.